The preliminary City staff report on the new 62-unit housing development proposed for 35 Wabash Avenue, across the street from Sorauren Park, goes before the Toronto and East York Community Council on Nov. 10. The agenda item can be reviewed here. Links to downloads on project studies such as shade studies can be found here. The staff report (PDF) is here, summarizing the findings to be presented to community council. Members of the public can attend the meeting, request to speak and also submit comments online through the City’s website. Click on the appropriate buttons at the top of the agenda item page. The development requires an amendment to the City’s zoning by-laws. 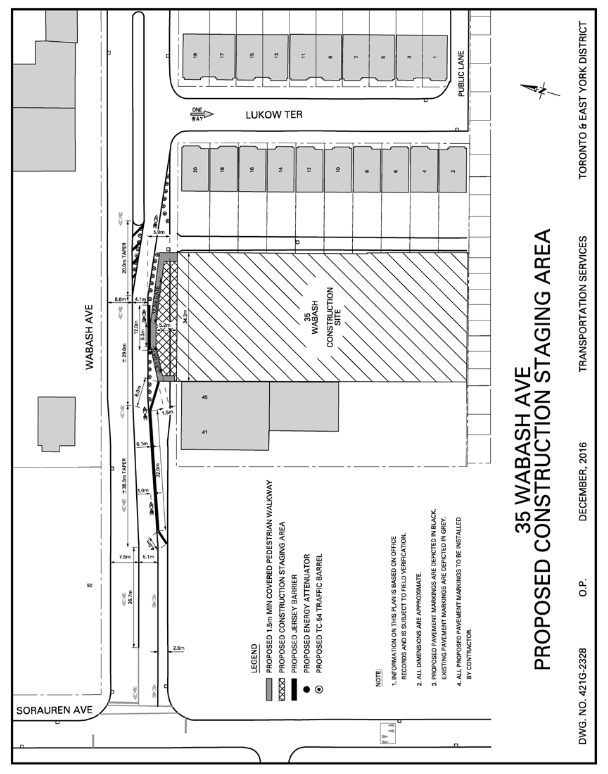 The developers are proposing a four-storey building containing 62 dwelling units and 65 vehicle parking spaces in one underground level at 35 Wabash Avenue. The proposed 11-storey condo development at 383 Sorauren Avenue, north of the park, is going to the Ontario Municipal Board for hearings. A pre-hearing is set for Thursday, Sept. 5 at 10 a.m. at the OMB offices at 655 Bay Street at Dundas. The pre-hearing will determine the date of the full hearing, but will also be an opportunity for the OMB to identify anyone who wishes to attend the full hearing, either as a party or as a participant, in opposition to or in support of the application. Councillor Gord Perks is inviting anyone who wishes to participate to contact his office for assistance, or to attend the pre-hearing 30 minutes earlier at 9:30 a.m. for a briefing. The City currently opposes the application but Council has also instructed the City Solicitor to work with the owner to enter into a settlement should the opportunity arise. Further information on OMB pre-hearings is available here. The rail corridor is a defining feature of Sorauren Park, and two upcoming events may inspire you to embrace the corridor in new ways… never mind the cancer trains! As part of the corridor’s expansion to accommodate approximately 200 diesel trains per day in 2015 instead of the current 50 or so, Metrolinx is planning to build noise walls taller than the Berlin Wall in certain areas, including the park. While the walls may be warranted in some areas, many people are opposed to Metrolinx’s plan, especially when it shows images of vinyl and concrete wall examples that would be graffiti bombed in about two seconds. On Tuesday, June 25, 7 p.m., Perth Avenue Housing Co-Op, 120 Perth Avenue, Brown & Storey Architects will outline a green alternative. Come out to embrace the rail corridor with green ideas, pathways and bridges rather than walls! An exciting development on the other side of the corridor is the planned extension of the West Toronto Railpath south from its current terminus at Dundas Street West, down to the Strachan Avenue area with a possible connection to the planned Fort York pedestrian and cycle bridge, which would link to the waterfront. On June 26, 5:30 – 8:30 p.m., at New Horizons Tower, 1140 Bloor St. W. at Dufferin, there will be a drop-in-style open house to introduce the public to the West Toronto Railpath Extension Study. The possibility of a bridge to Sorauren Park is also up for discussion. Be still our beating hearts!